Owners of early-2011 MacBook Pro continue to report GPU-related system failures, but Apple has yet to acknowledge the problem as widespread and, according to informed sources, is not planning a replacement program to remedy the issue. 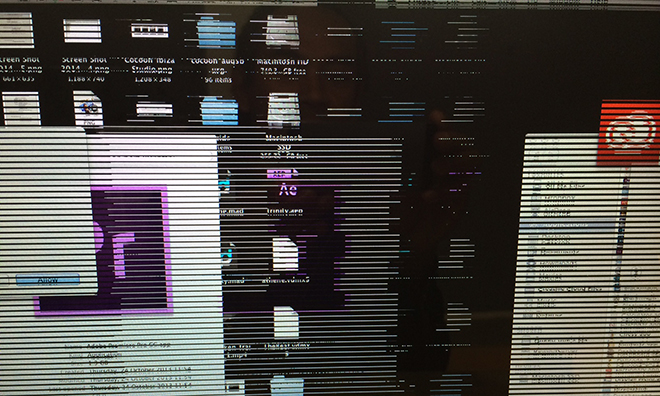 Image showing early-2011 MacBook Pro graphics issue. | Source: Apple Support Communities forum member "Andy_Gee"
People familiar with Apple's internal repair network have informed AppleInsider that the company has no immediate plans to initiate a replacement program for early-2011 15-inch and 17-inch MacBook Pro models suffering from systematic crashes and graphics failures seemingly related to the laptops' discrete AMD-built GPUs. While not yet common knowledge, some lower-tier Apple employees are aware of the situation. One Hong Kong Apple Store Genius, for example, has taken to directing out-of-warranty customers to third-party repair companies in lieu of official orders on how to handle the problem. According to multiple customer reports, local representatives in the U.S. and other countries are handling the matter in much the same way. Apple Authorized Service Providers are also seeing an influx of broken machines, sources say. In some cases, Apple has escalated AASP requests for further investigation up the chain and at least a handful of repair network managers have been informed of the issue. The total number of affected MacBook Pros is unknown, though one third-party service provider estimates recent repair intake for this specific problem stands at about ten laptops per week. Despite the case load, Apple is disinclined to take remedial action to curb incoming repairs, such as a replacement program. Known internally as a Quality Program, Apple's takeback, replacement and exchange initiatives are only activated in the event of severe, widespread or potentially dangerous hardware failures. A rare occurrence, the most recent program dealt with overheating Euro-spec 5W USB adaptors in June. Problems first cropped up in October 2013 when MacBook Pro owners began to complain of sudden system unrecoverable system crashes though to stem from GPU issues. A few months later in May, reports of failures spread significantly, an alarming trend that continues today. The rate of reported failures could even be accelerating, one person said. Apple could not be reached for comment on the matter. As noted in previous reports, the GPU issue might present itself onscreen as visual artifacts, banding or a blank screen. What triggers the failure is unknown, though a common thread seems to be graphics-intensive operations like watching high-definition videos and performing processor-intensive operations in digital media programs. Affected MacBook Pro owners have taken to Apple's Support Communities forum, with one of the longer threads racking up well over one million views and 7,611 replies since February 2013. Others have signed a Change.org petition asking Apple CEO Tim Cook and SVP of Software Engineering Craig Federighi to fix or replace MacBook Pro units subject to the "manufacturing defect." With 7,920 supporters, the petition needs another 2,080 signatures to reach its goal. For those few who still have an active extended AppleCare Protection Plan, failures pose more of an inconvenience than a dilemma, but out-of-warranty users must pay to have their MacBook Pro repaired. 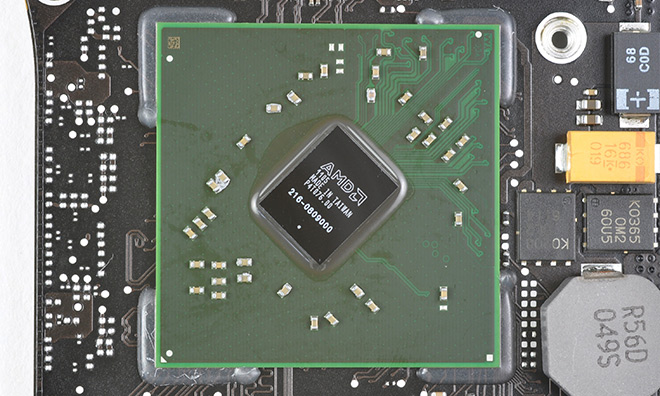 Since the AMD graphics chip is soldered onto the logic board, Apple or an authorized service provider must replace entire part. Not a cheap fix. As many three-year AppleCare warranties for the early-2011 MacBook Pro are likely expired, the chances of Apple introducing a replacement program are slim. Going forward, owners with faulty hardware will have two options: pay out-of-pocket for a replacement board or scrap the laptop as broken.